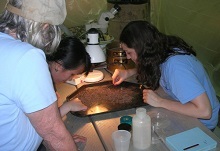 Preparing Environmental Professionals -- through Research and Education -- for 25 Years! A lot has changed since that first class of Environmental Science and Management students started back in the fall of 1992. Today, sustainability and the triple bottom line are guiding principles in the corporate world. Global climate change and carbon footprint now provide the impetus for greenhouse gas emissions inventories. Energy generation is more than ever, a central environmental issue; whether it's clean coal or unconventional natural gas and oil extraction. What hasn't changed is our commitment to stay at the forefront of environmental education, going strong since we launched the Environmental Science and Management program in Fall 1992. Now, in addition to our traditional master's degree program in Environmental Science and Management (ESM) and certificate programs in Environmental Science and Environmental Management, we now have a Conservation Biology track for the master's and an undergraduate B.S. in Environmental Science.